While Thomas U. Walter is credited as the architect of the Capitol Dome, his world-renowned design could not have been accomplished without Montgomery C. Meigs. 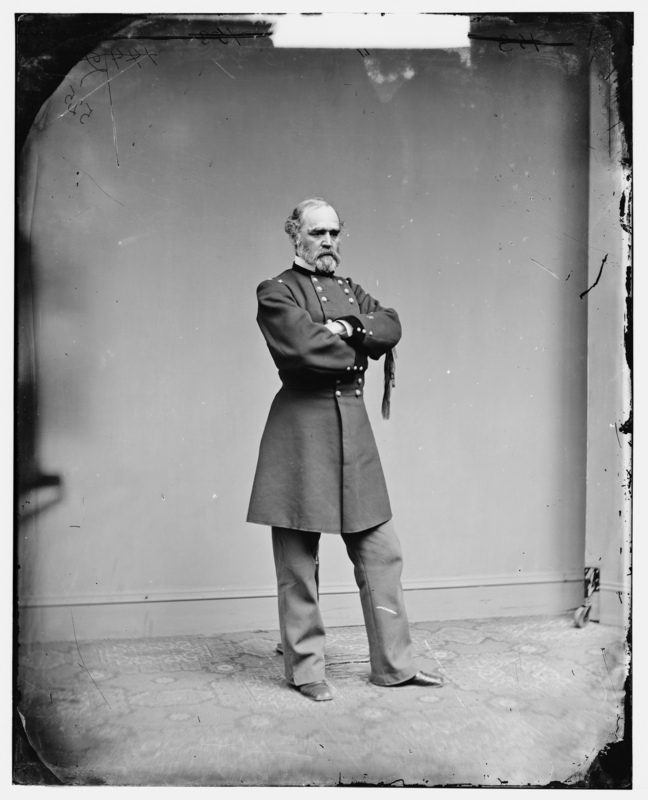 Captain Montgomery Cunningham Meigs (May 3, 1816 – January 2, 1892) was a career United States Army officer, civil engineer, construction engineer, and Quartermaster General of the U.S. Army during and after the American Civil War. During his career he had a role in building a number of well-known D.C. landmarks, including Union Arch Bridge across Cabin John Creek (the world’s largest single-span masonry arch for more than 40 years), Arlington National Cemetery, and the extension and dome of the U.S. Capitol. Meigs was an 1836 graduate of the United States Military Academy. He received a commission as a second lieutenant in the 1st U.S. Artillery, but most of his army service was with the Corps of Engineers, in which he worked on important engineering projects. In one of his early career assignments, Meigs served under the command of then-Lt. Robert E. Lee to make navigational improvements on the Mississippi River. In 1853, the War Department assumed control of the the Capitol extension project. Then Secretary of War, Jefferson Davis, appointed 36 year-old Meigs to run the project. He took the reins of the project energetically, immersing himself in the study of architecture, acoustics, heating, ventilation, and decorating. The primary goal of the project was to provide well-ventilated chambers where the nation’s legislators could hear and speak with ease. While the dome and Capitol extension were designed by architect Thomas U. Walter, the construction, funding and logistical challenges were Meigs responsibility. One significant engineering feat he accomplished was how to raise the cast iron to build the dome. In order to build the dome, Meigs designed a scaffold that rose from within the center of the Capitol Rotunda with a triangular footprint to stand clear of the floor’s unsupported center. He added two eighty-foot long “sticks” to the top of the scaffold to function as a mast and boom to lift the ironwork into place. A steam engine housed in a shack on the roof provided power to capable of lifting 20,000 pounds of material. To fuel the steam engine he first used the wood from the old smaller dome that was removed. Meigs also had a significant influence and role in a number of the fine arts and decorative design elements of the Capitol. He was responsible for the hiring of Thomas Crawford who would design the House and Senate Pediments and the Statue of Freedom. In addition he purchased the Minton tiles found on the Senate side of the Capitol and hired Constantino Brumidi, an Italian artist who had immigrated to America, to design the iconic Senate Corridors that bear his name and adorn the Rotunda with the Apotheosis of Washington. After six and half years as supervising engineer of the Capitol, Meigs left indelible marks upon the extension and the new Capitol dome. From mechanical ventilation to painted murals, from tile floors to sculptural enrichments, Meigs’s imprint can still be seen today. He believed the Capitol was more legacy than a job, and he worked tirelessly to make it as sturdy and beautiful as possible. Following his work at the Capitol, at the start of the Civil War, President Lincoln appointed Meigs quartermaster general, a crucial post that was perfectly suited to his organizational and management talents. Following the war, Meigs began construction of the Pension Building in Washington, D.C., today it houses the National Building Museum. He also oversaw much of the design and monument construction at Arlington National Cemetery built upon the grounds of the home of his former commander Robert E. Lee. Following his death in 1892 he was buried there with military honors, his tomb rests there today.